The death penalty for terrorists law being promoted in Israel by Defense Minister Avigdor Liberman once again highlights an issue at the center of a tug-of-war, showing the inability of the Israeli people to unify on a specific stance. Arguments for and against the law have flooded the Israeli press on whether it would really deter terrorists, and what it would mean for Jews. At face value, the Talmud justifies the death penalty for a person who acts with an intention to kill another person: “If someone comes to kill you, rise early and kill him first” (Babylonian Talmud, Sanhedrin 72:1). This law is no different for a terrorist as it is for any person making a move to murder another person. 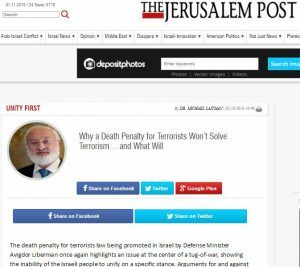 However, whether or not the death penalty will pass in Israel will not influence the problem of terrorism at its root. The whole discourse around the topic is like discussing whether chemotherapy or natural treatments are better for treating cancer: you will always get a different opinion depending on who you ask, and the entire discussion doesn’t deal with analyzing the problem, and its solution, from its causal basis. Therefore, I have no interest in meddling with the laws of the State of Israel, which are based on laws from the time of the British Mandate and also slightly earlier. If the State of Israel and the Jewish people really wanted to solve terrorism, then we would need to reach further back into our roots, to understand what makes us a Jewish people to begin with, and what laws we followed when we first became a Jewish people. Then, we might learn something about the laws that would have the power to completely uproot the problem of terrorism. As a united Jewish people, we enjoyed times of happiness and prosperity during the times of the First and Second Temple. Over time, however, human egoism evolved to a new level in humanity, including the Jewish people. It drove us apart and we became remote from our accordance with nature’s laws of unity. Ultimately, we replaced following nature’s laws with following man-made State laws. Egoism makes us consider personal benefit as having greater importance than benefiting others and the whole society we exist in. If we don’t apply ourselves to unite above our natural egoistic tendency, then we build our lives more and more in a way that is opposite to nature. Terrorism is just one of the obvious ways in which our world today shows us the outcome of our natural, egoistic development over thousands of years. We have sliced up humanity into myriad segments, sub-segments and sub-sub-segments. We value individuality over integrality, and the personal success of unique individuals or select groups over the collective success of society as a whole. This is opposite to how nature works. Nature views the planet and all its inhabitants as a single system, placing equal importance on all its parts. It is akin to cells and organs of a human body all playing a vital role in the health, sustenance and functioning of the entire body. Our increasingly egoistic and separated approach from nature not only divides us as a people, it is the cause for every misfortune and pain in humanity. As with the example of the human body, when a certain cell or group of cells start receiving more than what they need on account of other cells, it is considered as cancerous growth. Our emphasis on self-benefit over benefiting human society as a whole separates us from identifying with and following nature’s laws of love and unity, and makes us succumb to following our man-made State laws instead. Then, the more problems surface worldwide on personal, social and global scales, the more we have to revise our man-made laws, like how we continually need to revise our medicines for treating new epidemics. Therefore, if we approach the diagnosis and cure of the world’s many problems, including terrorism, at their source—our separation from following nature’s laws of unity—then by learning what nature’s laws are, and how we can observe them, we could pave the path to a harmonious and unified society, in balance with nature. The method for the discovery and application of these laws is the same method Abraham developed, the wisdom of Kabbalah. Today, this method is undergoing a modern resurgence as thousands of people worldwide, who feel the world’s current paths are leading to dead ends, start regularly gathering to discover their long-lost connection with nature, and revitalize the sense of purpose, love, unity and closeness with nature that Abraham’s group once pioneered. Using this method, this worldwide group has become a research lab of a society based on the discovery and application of nature’s laws. If there are strong, united ties in social relations propelled by the continual learning, encouragement and promotion of pro-social values, such as unity, love, giving, mutual consideration and kindness, then negative egoistic phenomena won’t have a chance to surface. For instance, punishment would not surface as we know it in our world today, as a penalty for an offence that was done. Punishment would be felt as an inner sensation within the person, when the egoistic inclination grasps the person’s desires and thoughts with its demand for personal fulfillment on account of others. In a society functioning according to nature’s laws, each person would have the necessary grounding, tools and supportive social environment to work with their egoistic, criminal inclinations before they materialize. Likewise, a person would be able to apply punishments, including even a “death penalty” to his own egoistic inclinations, as he would not want to harm the social atmosphere. In the Kabbalah method, such a version of punishment is called a “correction” of our nature. These corrections bring us closer and closer to the opening of a new, expansive nature where threads of love, unity and consideration bind us together. Other than the above-mentioned times of the First and Second Temples, we have never created this kind of social atmosphere, and today our egoism runs rampant in society. As its effects of growing social division, Nazi, fascist and xenophobic tendencies, and terrorism flare up, we can either continue trying to create different kinds of band-aids and plaster them all over the place, or we can start aligning ourselves with nature’s laws and treat these problems and others at their root. It is my hope that we will discover this positive social atmosphere that aspires to balance with nature’s laws sooner than later. The worldwide group now working on implementing this method is open for everyone to join, and already in its early stages, people immediately vouch for wondrous new sensations and perceptions that open up to them as a result of even minutely making tiny efforts towards connection and love in a society that upholds those values. It is also my hope that human society will discover the splendor of living according to nature’s laws, and that it happens sooner, through learning and encouragement, rather than later, through pains and sorrows. 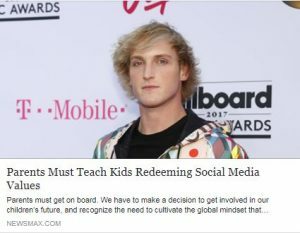 Parents of the 21st century, the Logan Paul controversy must become your wake-up call. How on earth did he get the idea that filming a dead body is appropriate? Logan Paul is a 22-year-old who grew up in a culture that surrounded him with visual depictions of gore and violence. Like typical Americans his age, Logan had watched more than 200,000 acts of violence that include more than 16,000 murders by the time he was 18. He also watched children’s programming that displays up to 20 violent acts per hour. 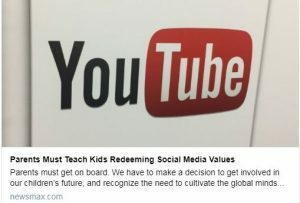 So parents, if you’ve had enough and want to take back control over your children’s upbringing, I suggest you join hands and demand from YouTube and other social media platforms to toughen up their regulations, so users cannot upload inappropriate content. But regulations, sanctions and precautions won’t really solve the root of the problem. Sooner or later, there will be no escape from taking our education system and its methods through a complete makeover. Parents, understand your kids’ world. They spend 8-11 hours a day glued to their screens, mostly on social media. They get bored easily, and quickly move on to the next attraction with a swipe of their finger. We passed the stage where education was about information and knowledge. Our education must now focus on building the human being. And that means building a value system within the person and a social environment around the person that balances the human ego and directs it towards positive realization. Question: If I ever attain spirituality in this world, in this incarnation, will I feel spirituality in my subsequent corporeal incarnations? Or will I feel my body as a temporary shirt and have the opportunity to use it properly and correctly? Or will I need to begin everything from the start, from complete disconnection from spirituality? Answer: If you haven’t finished your way, you will quickly continue it. Question: Is it true that all of my feelings, all of my thoughts, and all of the situations and circumstances in my life (with all the details that exist in them) come only from the Creator, purposefully, only to bring me closer to Him? Answer: Yes, even if you disagree with this! Question: What is the maximum number of years left for our world to exist? Please tell me how many years maximally we will continue to live in this world from this moment on? Answer: It will be as many as the world requires for its full completion of correction! Question from Facebook: I love my egoism. For others it might be a problem, but not for me. Why should I do anything about it? Answer: You don’t have to do anything about it. But others around you who are also egoists do not want to do anything about their egoism either. And little by little you will begin to devour each other. Eventually we will come to a place where we will need to begin to cooperate because technology and nature is arranged against the individual. The surrounding world is entirely closed and integral. And all this exerts a great deal of pressure on us. We cannot be different. Our innate nature is egoistic. And it is beginning to devour itself. We see that humanity is losing its orientation to freedom, the future, and even to caring about children or family, etc. If we simply want to drag out our existence and die out like dinosaurs, then it’s fine. But if we want to live, we need to change ourselves. And nature is showing us which way to change. Question: Is the statement “I love my egoism” correct? Answer: It’s completely true. But what can we do? We will need to part with the method used now. Receiving only for ourselves, using our egoism only for our own benefit, will not work. We need to learn to use it for the common good, and then you will be fine, and your egoism will be very comfortable. How Does A Kabbalist Treat Suffering? Question: How much is a Kabbalist resistant to feelings of suffering, emptiness and disappointment? Answer: A Kabbalist is sensitive to physical suffering. Just like everyone else existing in physical bodies, he remains as an animal and also perceives everything. There is no difference between him and other people in this. Another matter is his attitude toward the source of the suffering. He justifies Him fully because he understands how much this helps him break away from egoism. Therefore, a Kabbalist relates to illness and other adversities quite differently.